The premium homebuyers are required to pay to live in one of the UK's cities has risen to its highest level on record, according to new Halifax research. The Halifax Cities Review, which tracks house price movements in 59 cities in the UK, reveals that house prices are, on average, 7 percent (£14,462) higher than their county average, the highest premium since records began in 1983. The average house price across UK cities rose by 65 percent - or £68,236 - over the past decade, which is equivalent to a weekly increase of £131. House prices across the UK as a whole increased by 56 percent over the same period. Inverness - awarded city status in 2000 to mark the new millennium - recorded the highest rise in house prices over the decade (148 percent), followed by Truro (121 percent) and Hull (119 percent). 56 percent of UK cities have a higher average house price than their county average and seven of the 10 cities with the highest premium are in the south. Winchester has the largest premium with houses trading at 77 percent above the average house price in Hampshire. Westminster has the next highest premium with prices 74 percent above the Greater London average, while Lichfield in Staffordshire has the highest premium (58 percent) outside southern England. However, there are some notable exceptions to this with the three cities that are most affordable relative to their county average also located in southern England (Portsmouth, Gloucester and Plymouth). The city with the biggest discount to its county average is Portsmouth, where the average house price of £141,871 is 31 percent, or £63,344, below the Hampshire average. House prices in city locations also experienced smaller house price falls during the downturn in the housing market. City property prices fell, on average, by 17 percent between 2007 and 2009 compared to an overall fall of 24 percent across the UK. Over the past year, city house prices have declined by 2.5 percent, lower than the 4.3 percent drop in the average UK house price. House prices have also risen much more rapidly than earnings, with the typical city home costing 5.2 times the average annual salary in 2011. 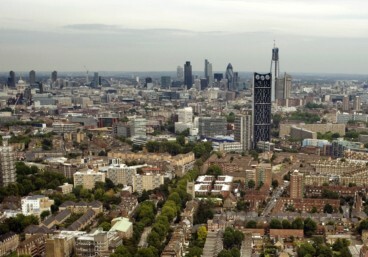 Suren Thiru, housing economist at Halifax, said: "With the housing demand and supply imbalance that characterises the UK property market often more acute within our major urban conurbations, homes in cities across the country are typically trading at a marked premium over neighbouring areas. "City house prices are generally supported by demand from those looking to gain from the economic and lifestyle benefits often associated with residing in major urban areas, as well as by the pressures on the housing supply that often typify such locations."